Organise Your Literature with this Sleek & Simple Display! 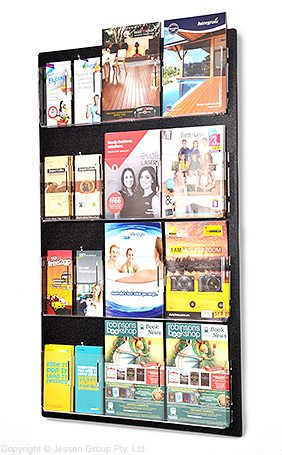 This unique wall mounted brochure holder is exclusive to Slimline Warehouse and also incorporates a number of unique features that you won’t find offered by other wall pamphlet holders on the Australian market. All this and we’re still making them available at a price that is sure to please. The most notable feature of these wall mount literature racks or A4 brochure holders is that they can display any combination of either A4 (297 x 210mm) or DL (210 x 99mm) material. The wall rack comes standard with clear 3mm acrylic pockets, but simply by snapping one of the supplied divider pieces into place, the pocket is then set up to hold two DL flyers. This ensures that no matter what literature you may have to distribute in the future, one of slimline brochure racks will have you covered. These literature dispensers, or pamphlet racks, are also only 50mm thick so they sit neatly on the wall without intruding on your interior space or obstructing the movement of customers around your premises. Similar brochure displays on the market overlap the documents on display, making it difficult to browse the selection on offer. These wall brochure stands do not overlap the brochures, but present the full face of the brochure to the viewer through the clear plastic pocket. This results in a thinner display and allows patrons to easily browse all the material on offer. By using one of our wall leaflet racks not only will all your marketing collateral be presented at to the viewer at eye level, but it will also be kept neatly arranged. This DL brochure holder or A4 brochure holder is supplied with all the fasteners you require to attach it immediately to your wall. The installation process is quick and easy – just screw the 4 screws supplied into your wall and hang the brochure rack in position. We have a huge range of Brochure Holders and Brochure Stands to cover any of your marketing needs… And they’re all in stock and ready for same day despatch!